This stylish back bar shelf saves space on your bar and makes it quick and easy to find what you need. This chic back bar shelf saves space on your bar and makes it quick and easy to find what you need. 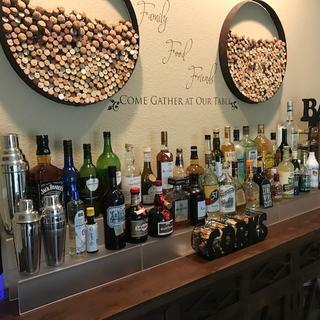 These sturdy bar bottle shelves have two-levels, so you can display lots of liquor and stay organized at the same time. They’re made of solid acrylic, so they won’t bend or buckle — even when loaded with full bottles of booze. Plus, they’re translucent so they look really awesome all lit up. This sturdy piece of easy-to-clean plastic will do wonders for your bar’s decor and keep everything neat and accessible, nice! Just added another two shelves to our bar area, Looking good. Great Product and great quality. I bought this for my home bar. It's exactly as advertised. The acrylic looks like frosted glass and it feels sturdy enough to last for decades. It looks great in my bar and I'm glad I bought it. $70 feels like a lot to drop on a simple acrylic shelf; if it was $40 it would be a five-star product. On the husbands Christmas list. I am adding to similar product I already have in my bar. BEST ANSWER: I had both the regular size and large bottles originally displayed. It holds both just fine but I prefer the smaller bottles, it holds more and looks nicer, I believe. I store the larger bottles in a cabinet and use them to refill the smaller ones with the same liquor, obviously. Works out great. The shelves are 3.5" deep. They will hold larger bottles just fine. Can i put some rope lighting under then or will it be too hot? BEST ANSWER: If you would like to add rope lighting I would recommend using LED lights rather than incandescent since they put off significantly less heat! Cheers!